Portraits of historical figures using their own words. "Good Trouble," all-action portrait of John Lewis. For the last few years I've been drawing portraits of great black leaders entirely with their own words from their great speeches. I wanted to draw a portrait of John Lewis for this series, and while Lewis has given some great speeches, he's also been arrested at least 45 times for getting into "good trouble" in the nonviolent struggle for justice, from sit-ins at segregated lunch counters to Freedom Riders to protests against apartheid and genocide in Darfur. And then some fool went and called John Lewis "all talk," and so I made this portrait to honor John Lewis for having the courage to step up when necessary and being pretty much "all action." 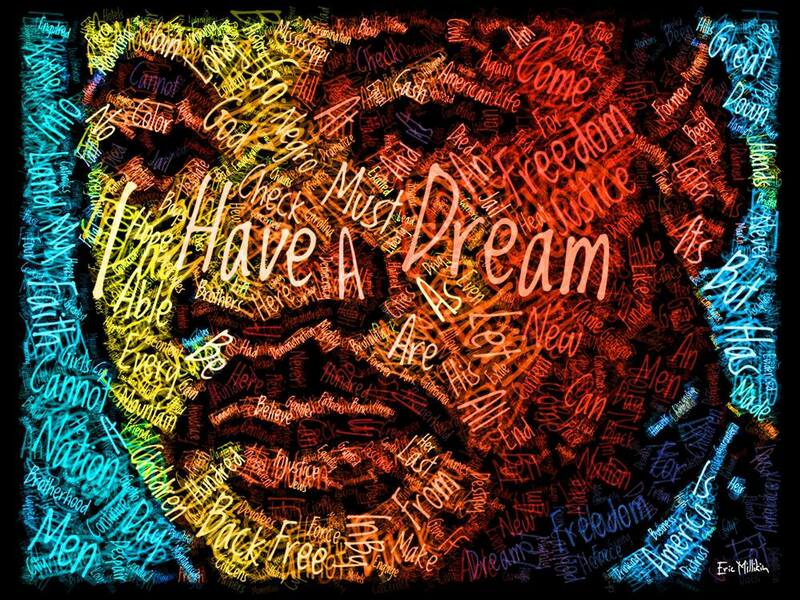 Portrait of Dr. Martin Luther King Jr. made entirely from the words to his "I Have A Dream" speech, 30 feet wide and 10 feet high, LED. Metro Detroit at roughly 4539 S Telegraph Rd, headed North, between I-94 and Michigan Ave.
"Barack Obama: Hope Over Fear"
"Hope Over Fear" portrait of Barack Obama created using the words to his first inaugural address. 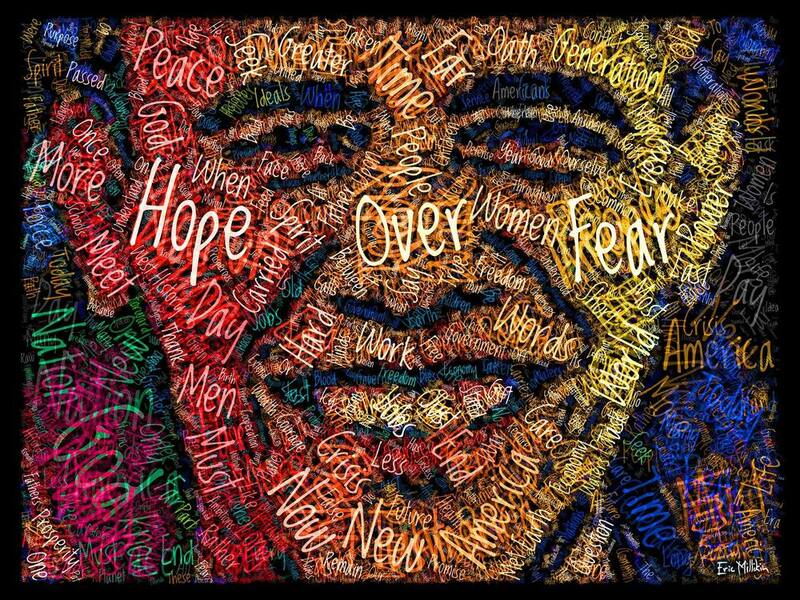 "American Dream" portrait of Michelle Obama created from the words to her speech at City College of New York, her last commencement address as First Lady of the United States. Here's my earlier "American Dream" portrait of Michelle Obama, which will be auctioned Aug. 6 in Washington DC by the National Association of Black Journalists to raise money for scholarships. "Malcolm X: By Any Means Necessary"
"Any Means Necessary" portrait of Malcolm X. "Martin Luther King, Jr.: I Have a Dream"
"I Have a Dream" portrait of Martin Luther King Jr.
"Harriet Tubman: Bound for the Promised Land"
Portrait of Harriet Tubman created from the words to the song "Bound for the Promised Land," a version of which she sang as a code while escaping and rescuing other enslaved people along the Underground Railroad. "Frederick Douglass: The Hypocrisy of American Slavery"
Portrait of Frederick Douglass created from the words to his "The Hypocrisy of American Slavery" speech. 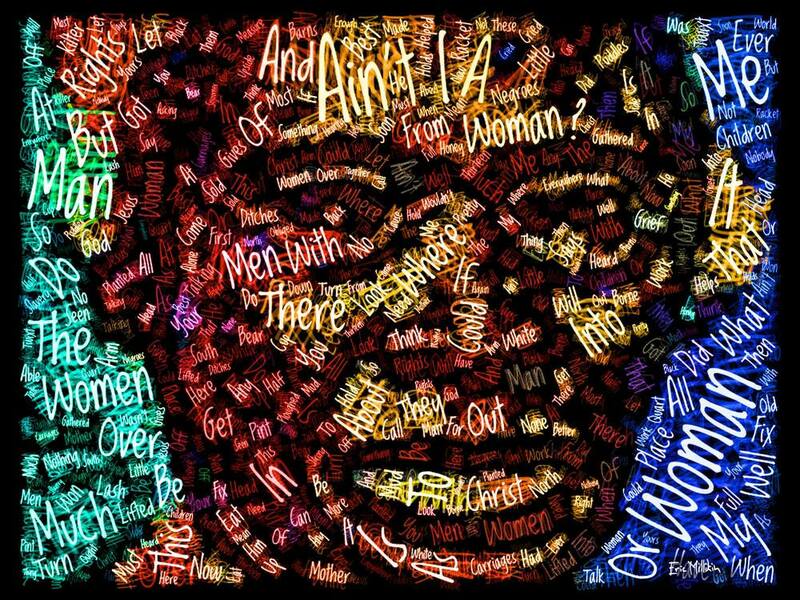 "Sojourner Truth: And Ain't I a Woman"
Portrait of Sojourner Truth drawn from the words to her "Ain't I a Woman?" speech. "Ruby Bridges: Racism Has No Place"
Portrait of Ruby Bridges, who was the first black child to attend an all-white elementary school in Louisiana during the 20th century, when she was escorted to school by U.S. Marshalls on Nov. 14, 1960. Words here are from her quote "My message is really that racism has no place in the hearts and minds of our children," as well as the 1954 Brown v. Board of Education Supreme Court decision, which declared "separate educational facilities are inherently unequal." "Viola Liuzzo: Change the World"
Portrait of civil rights activist Viola Liuzzo using the words she had told a friend, "You and I are going to change the world," and from her FBI files, obtained through the Freedom of Information Act. Viola traveled from her home in Detroit, Michigan to Selma, Alabama to assist and participate in the Selma to Montgomery civil rights marches. Afterward, she was shot dead by members of the Ku Klux Klan. 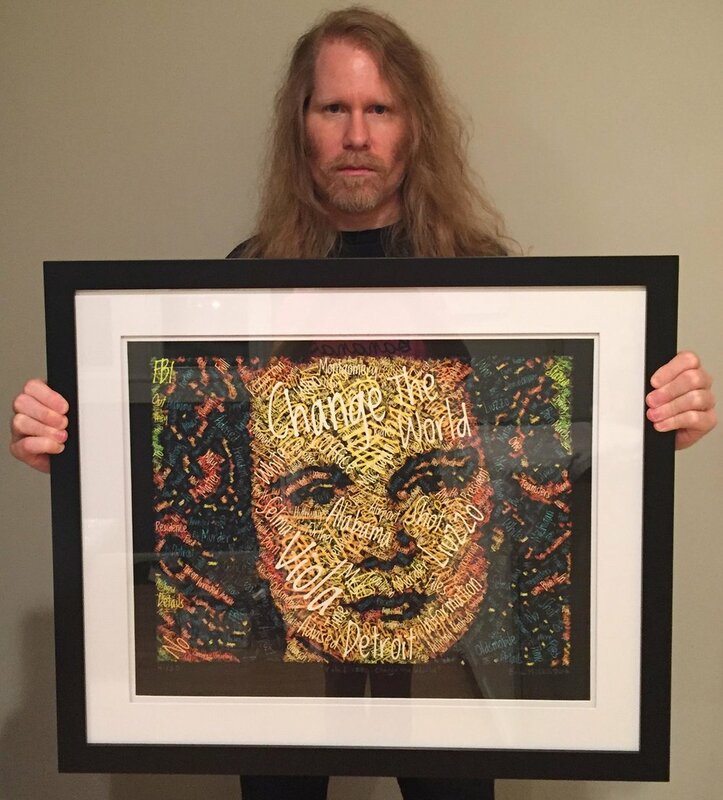 One of my "Viola Liuzzo: Change the World" portraits was auctioned to raise money for Global Ties Detroit, the Detroit non-profit arm of the Department of State, dedicated to world-wide diplomacy. 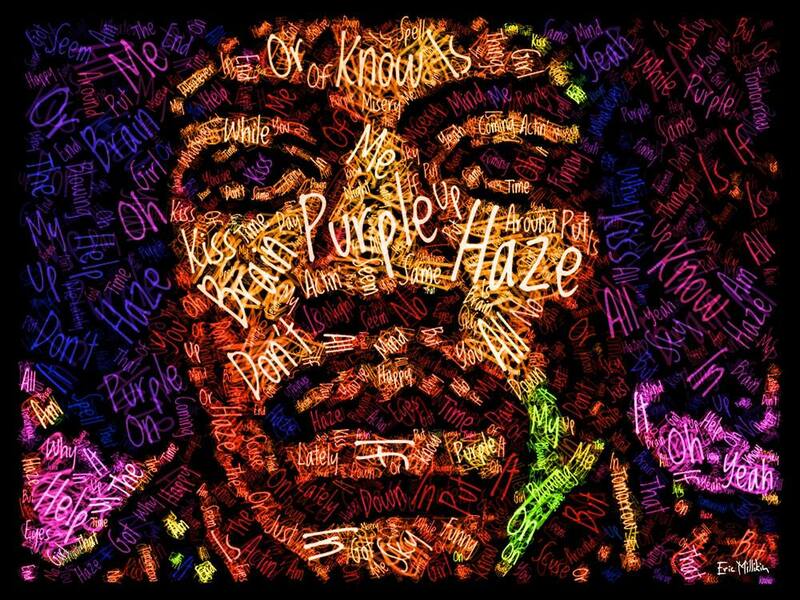 "Muhammad Ali: Sting Like a Bee"
I'm so mean I make medicine sick ..."
"Purple Haze" portrait of Jimi Hendrix. 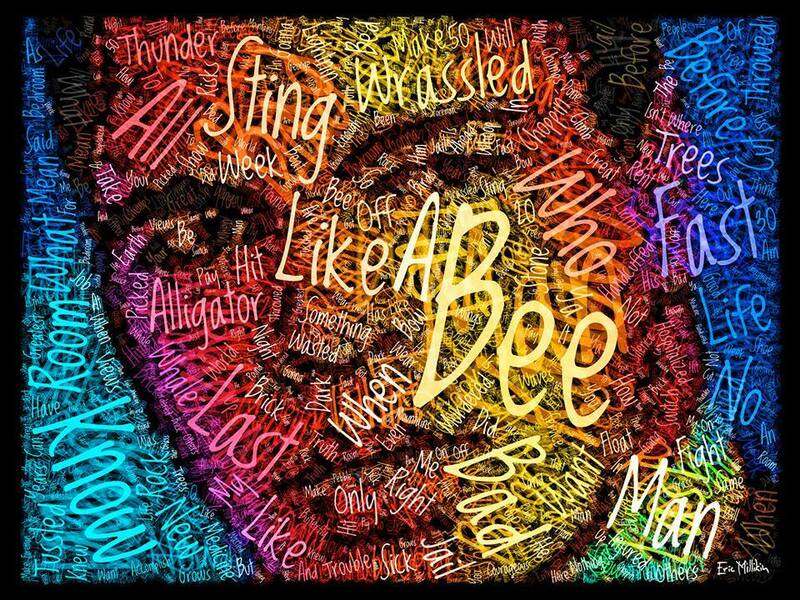 Portrait of Miles Davis created from the titles of his songs. "Miles Ahead" is the title of his 1957 album. 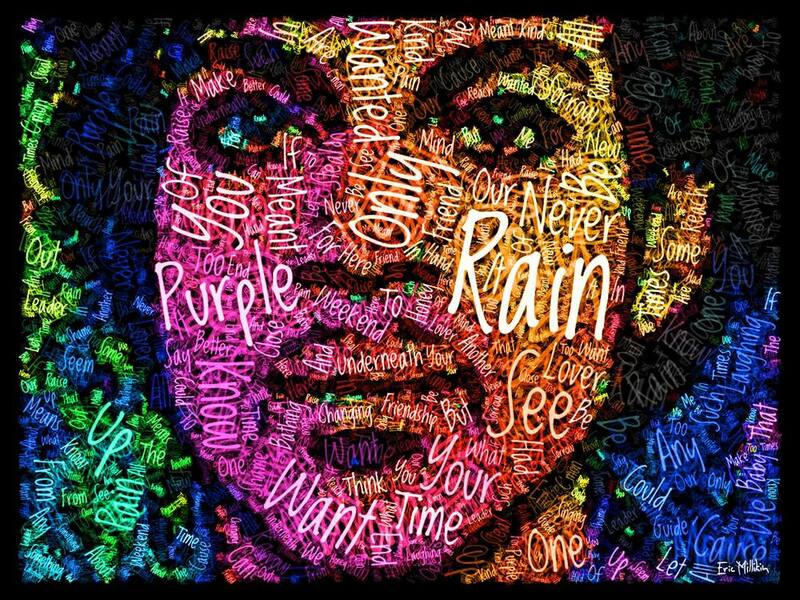 Portrait of Prince created with lyrics from the song "Purple Rain." June 28, 2017 by .